Available from Amazon and other good online retailers (also available as an eBook). David Sutton may be a local author but he has an impressive pedigree as a writer and editor (one I must admit that I was not aware of until I read this book). Based on these stories, I have been missing some very accomplished storytelling. David Sutton is the recipient of the World Fantasy Award, the International Horror Guild Award and twelve British Fantasy Awards. He has been writing since the 1960s and also owns the small press company Shadow Publishing. This collection contains eighteen stories dating from 1976 to 2015, including two completely new stories. The stories display an impressive imagination and vary extensively in theme although all contain some element of the fantastical or weird. This is a very strong collection and although some of the stories are horrific they are usually subtle and build tension very effectively. Refreshingly, they also do not rely upon nasty things happening to young women (or men for that matter), which is one of my pet aversions. Unusually I don’t think I could name one story that I didn’t feel of some merit. With eighteen stories I can only describe some of my favourites to give you a flavour of the book. The first story, “The Fisherman”, is set in a remote Welsh village and revolves around the mysterious disappearance of a fisherman’s wife and what he might be obsessively fishing for in the remote bay at night. The author’s use of metaphor and vocabulary is lovely; short but precise and has a Bradbury-esque feel to it at times. “Mind-Forged Manacles” is a science fiction story set in a future Australia and the confrontation between an aboriginal woman protecting a nature reserve, and the company man sent to clear her land for industrial exploitation. This story is multi-layered with physical and ideological conflicts between the protagonists which leaves you thinking even after the conclusion. On a lighter note, there is also “Innsmouth Gold”, a homage to H P Lovecraft’s Cthulhu stories. Whilst the story of an adventurer after bootleggers’ gold who discovers the macabre inhabitants of the abandoned town works well without an awareness of Lovecraft, the little “Easter eggs” for those readers familiar with his work add to the fun of this eerie story. 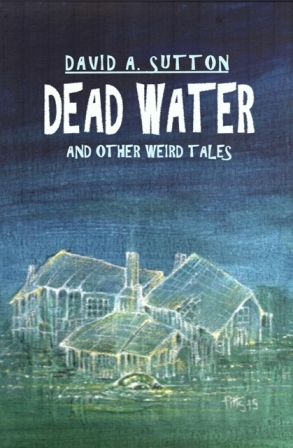 Finally, there is the eponymous “Dead Water”, set in the salt marshes of the Camargue in France. It concerns two bird watchers who get lost at dusk amid the narrow causeways and salt pools and stray into a prohibited area, much to their regret. The story starts with a light tone and gradually very effectively builds menace.